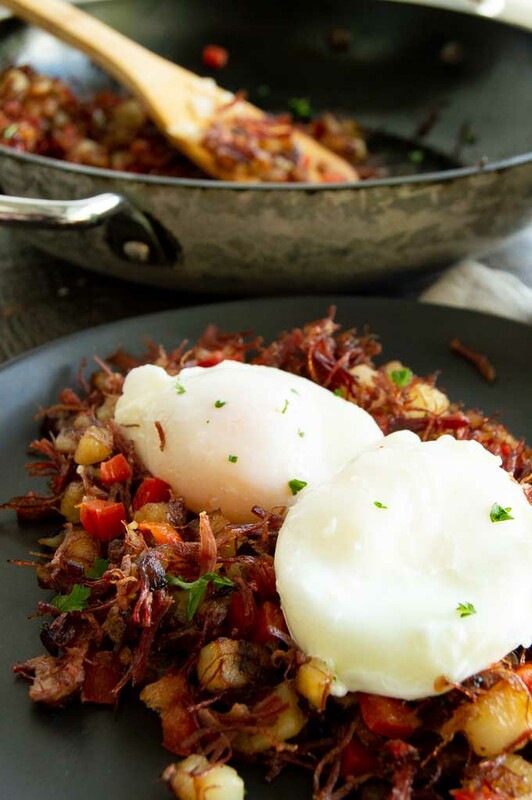 When you have leftover corned beef after St.Patrick’s day this hearty brunch of corned beef hash and eggs over the top will be a sure fire way to use it up in a way your family will love. 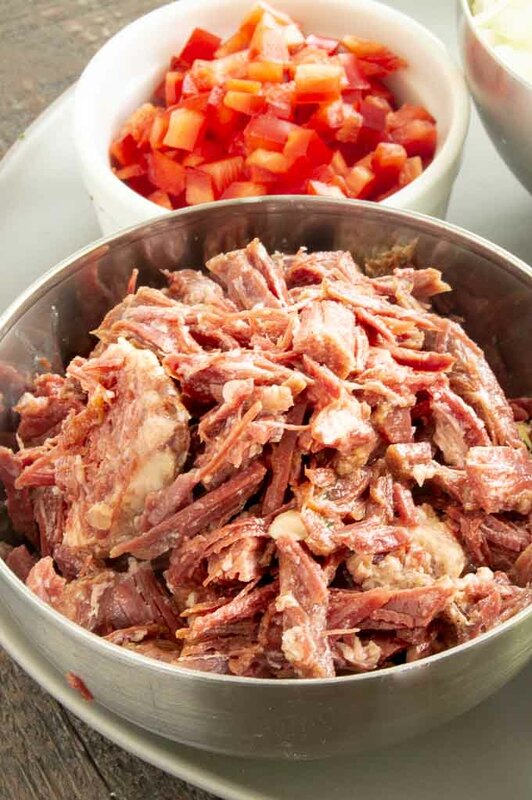 The corned beef is in small chunks that crisp on the edges so they are both succulent and crispy in each bite. But I digress. Back to answer the question of what to do with leftover corned beef! 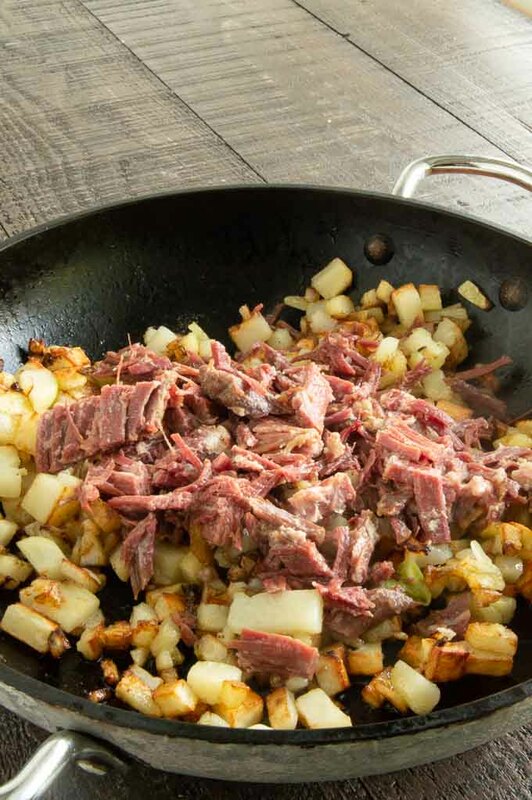 In this classic St Patrick’s day brunch, that glorious corned beef is mixed in with diced potatoes, peppers, onions and simple spices to give a full flavor explosion in each bite. You can serve it the the classic way with a soft boiled egg over the top so that when you cut your egg the yolk bursts out and creates a delicate creamy sauce to get even more of the corned beef hash on every forkful. Where does Corned Beef Hash Come from? 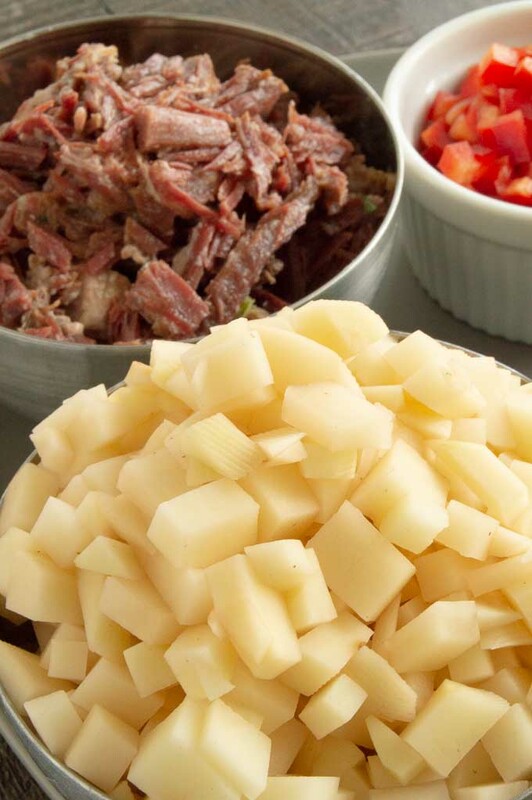 Most people think corned beef hash is Irish but the Irish version is actually made with salt pork. Due the the price of corned beef, which is an Irish meat, they tended to export the corned beef to England but when they would make recipes that called for corned beef they would substitute salt pork (bacon) because it was cheaper. 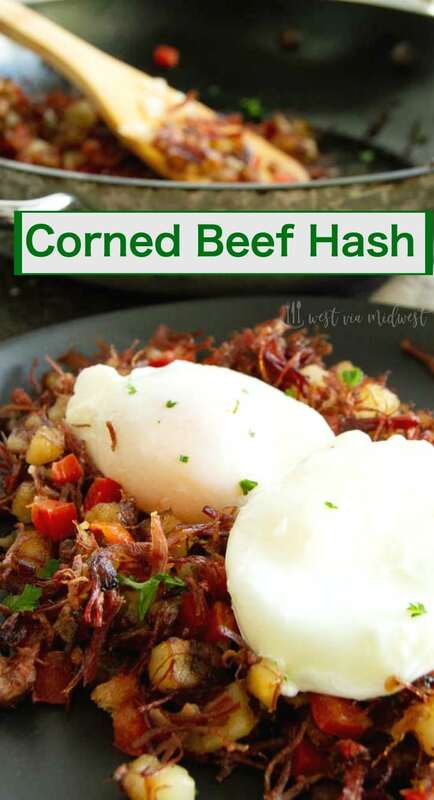 Corned Beef has become a staple in St Paddy’s day celebrations and the days after the big celebration with the leftover corned beef being used in this classic breakfast hash and eggs. 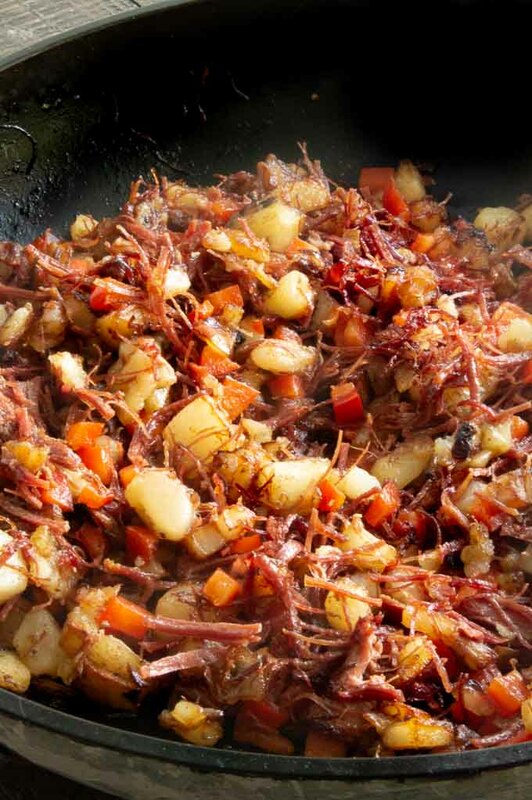 Hash is a dish that is made from chopping all of the ingredients then cooking them and mixing them all together. 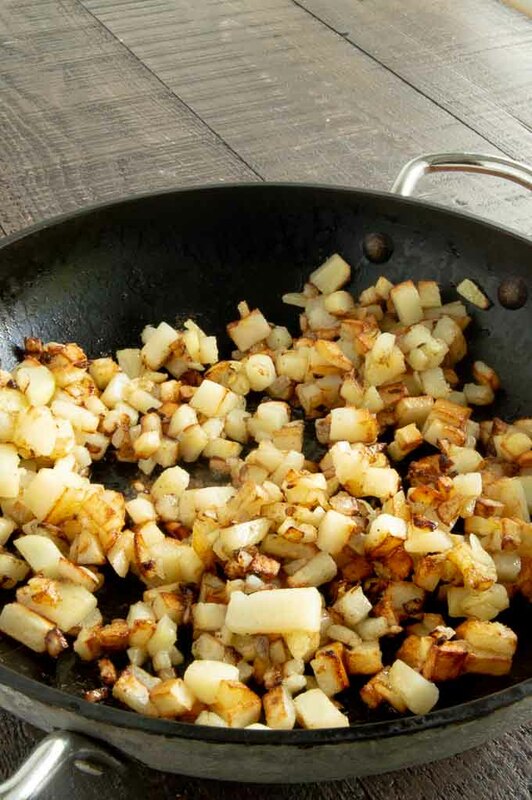 The word hash comes from the French word hacher which means to chop so it is a complete literal translation. 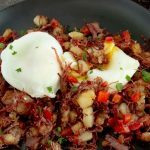 Easy corned beef hash takes very few ingredients and most of them you probably have in your pantry. I used the leftovers from my homemade brined corned beef (that I will share with you next week) but you can use store bought corned beef too. This recipe will also work with the deli corned beef and canned corned beef. You’ll just substitute the corned beef roast with the same amounts of canned corned beef or pieces of deli corned beef. 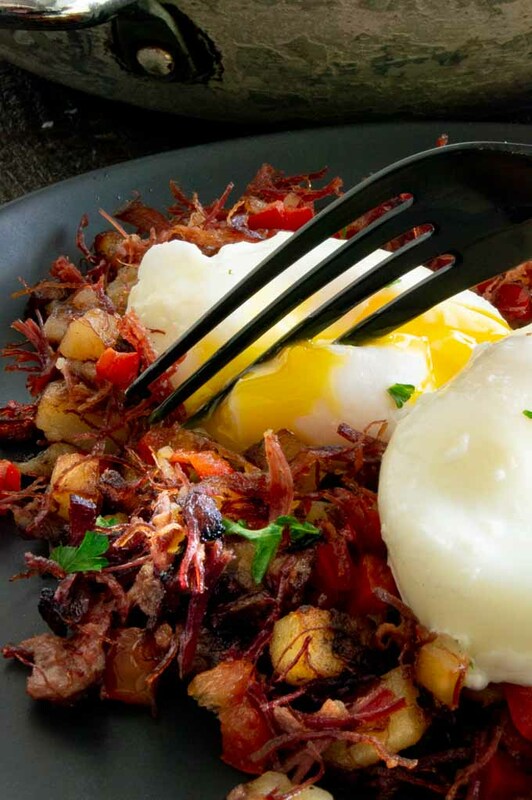 How to make Corned Beef Hash and Eggs? Use a heavy skillet or preferably a cast iron skillet for cooking. It conducts heat so that the recipe comes out perfect every time. Get your oil nice and hot before adding in the potatoes. It wont take much oil at all, about 3 tablespoons at most. Dice your vegetables in like sizes for even cooking. This will help with super crispy in one part and soggy in other. 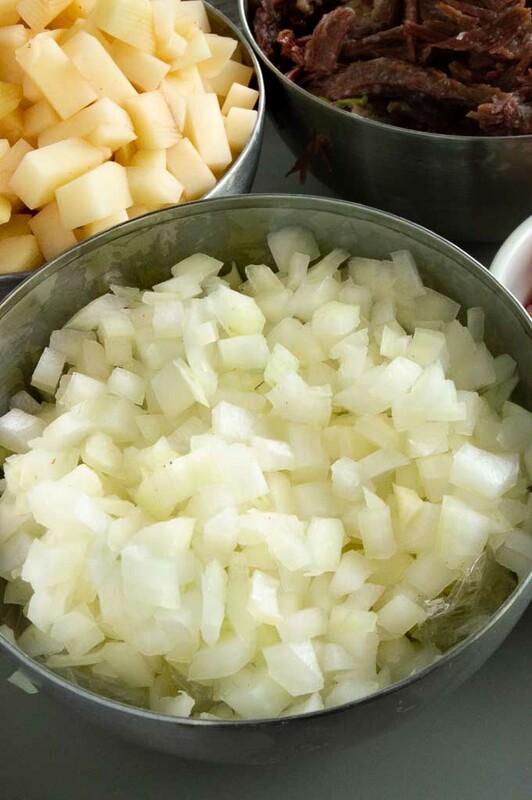 Cook the potatoes and onions until almost done before adding in the corned beef so you get crunchy potatoes on the outside with fluffy inside. This also makes sure the corned beef keeps its juicy succulent texture. Poach your eggs for 3 mins for the perfect runny egg yolk. For the best corned beef hash you’ll want to serve it as soon as the eggs are ready so you get the nice runny egg yolks while they are hot! Corned Beef Hash and Eggs in the oven. If you don’t want to poach your eggs you can use the same pan you made the hash in to bake the eggs in the oven. Preheat the oven to 375° Make several wells to place the eggs in. Crack the eggs into the well and bake in the oven for about 5 minutes until the whites of the eggs are opaque and you have a soft yolk center. 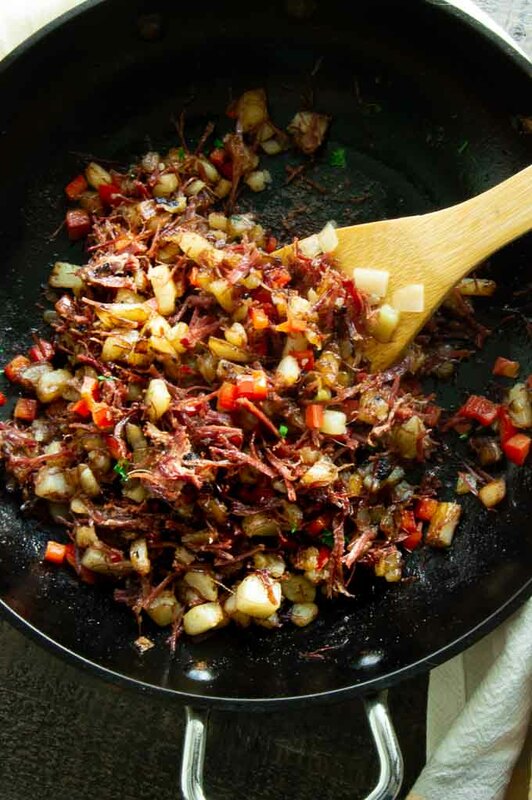 This one pan method is a great way to serve a big group of people corned beef hash all at once for a Brunch. Homemade Corned Beef from scratch! Potato & Chorizo Hash ~ a twist on classic hash!! 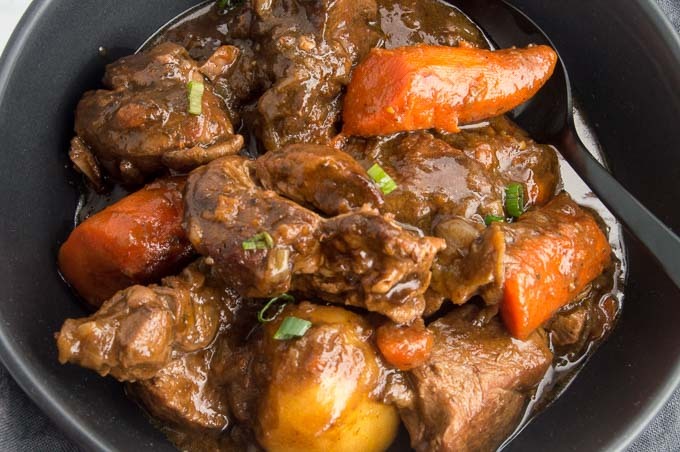 (Even better… sign up for the mailing list at the bottom of this post for weekly emails on fun tips and tricks for making delicious recipes for entertaining with out all the stress! 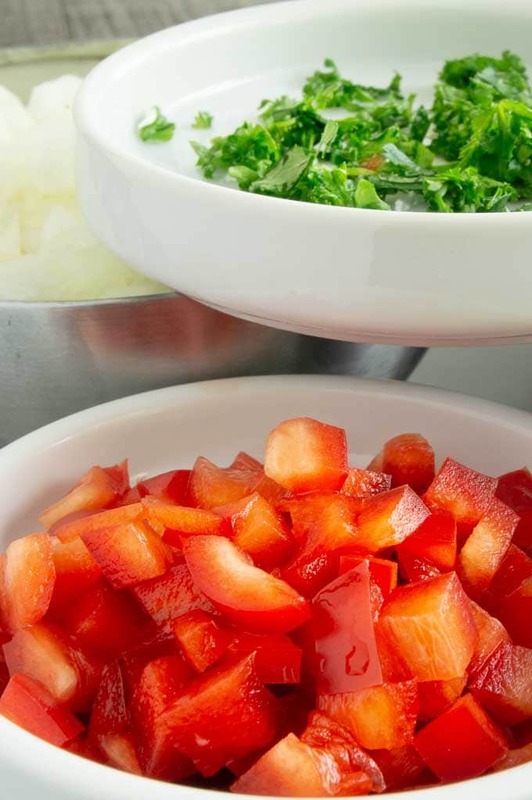 Prepare all ingredients by peeling, chopping and dicing as indicated in the ingredient list and have them in small bowls ready for using. 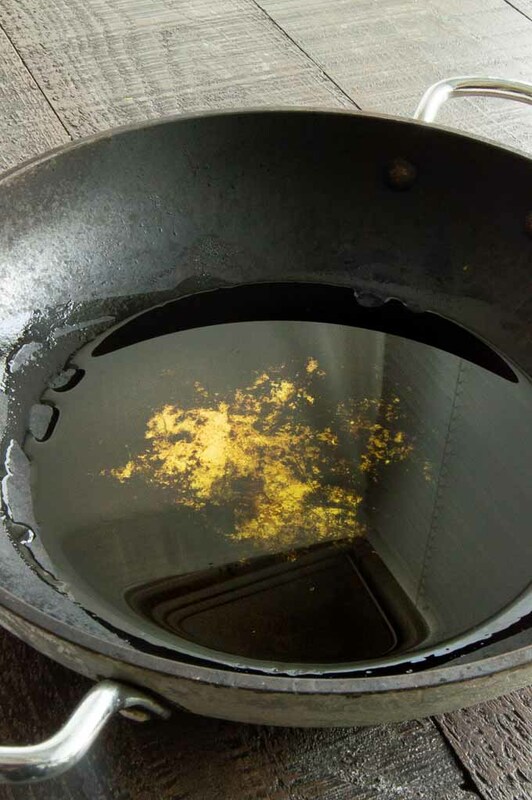 In the bottom of a cast iron skillet add olive oil and heat to high. Add onion and potatoes and sauce until edges of potatoes are turning golden brown and are starting to get crispy. While the potatoes/onions are cooking bring a pot of water to boil. Once you add the corned beef to the potatoes you will start the eggs. Crack an egg into a measuring cup making sure there is no shell in the cup. Once boiling reduce heat to a simmer. 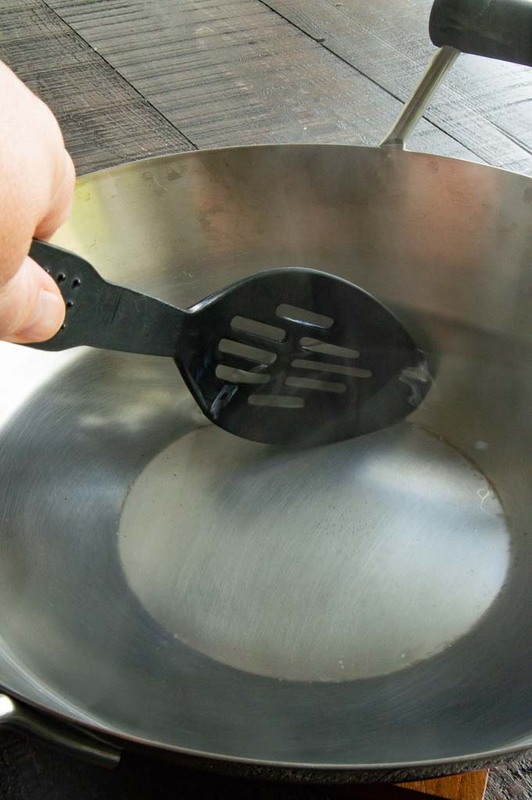 Using a slotted spoon swirl water. 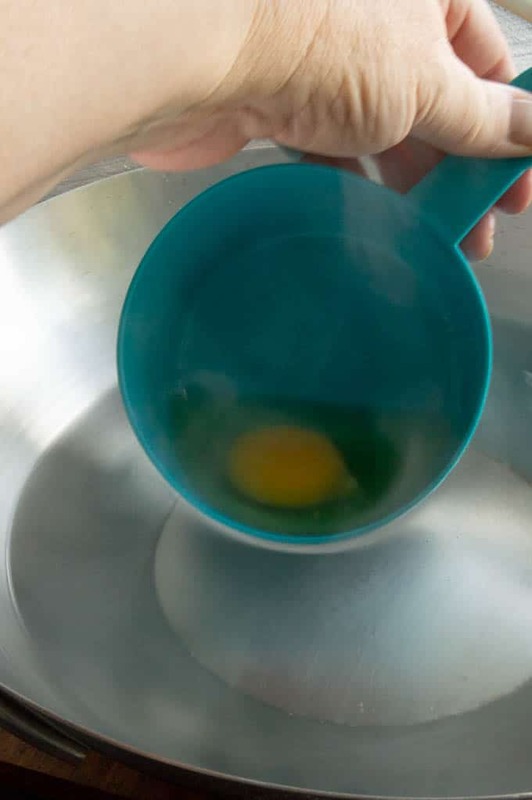 Then place measuring cup into the water continuing to swirl water as you add the egg. 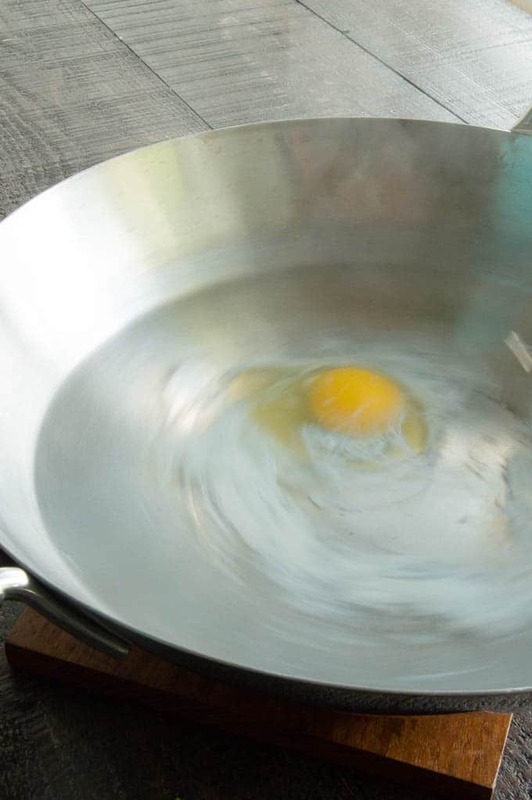 Once in, use a spoon to swirl water one more time so the egg doesnt stick on the bottom of the pan. Add 2-3 more eggs at a time and cook for 3 minutes total to get a perfect poached egg. See notes for baking eggs instead. (The swirling of the water makes sure it doesn't stick to the bottom but also gives you the nice oval shaped egg when done poaching. Add corned beef and red peppers and reduce the heat to medium. 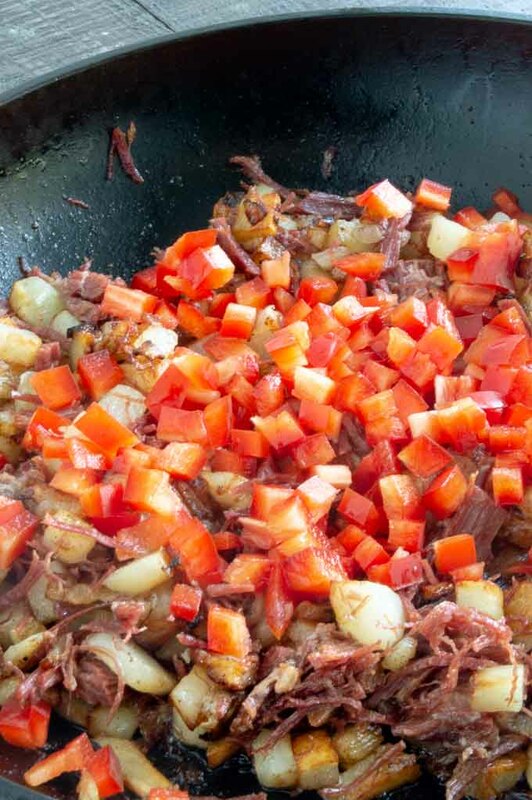 Cook until the corned beef is hot and the edges are crispy and the peppers are softened. Place eggs on top and serve immediately. This is all sorts of yum! 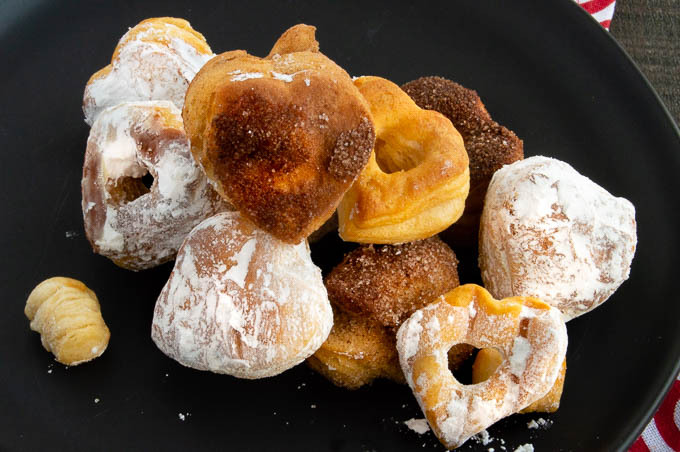 Love this recipe idea and the detailed step by step instructions. That poached egg looks amazing and perfectly cooked! This is one of my favorite breakfast dishes.